Some of my most favorite Silhouette products are the printable adhesive papers–they have white, kraft paper, clear–because there are so many fun options for labels and tags. Christmas is quickly coming, and I always start in October with my planning and project list, so I can really enjoy the month of December with my family. Christmas cards are one thing that can go out right after Thanksgiving, and I thought it would be fun to make some cute adhesive labels for the back of the envelopes. Have you ever used the print & cut feature on your Silhouette? I LOVE it. It’s so easy, and it’s how you can get text and images on the labels you cut out. 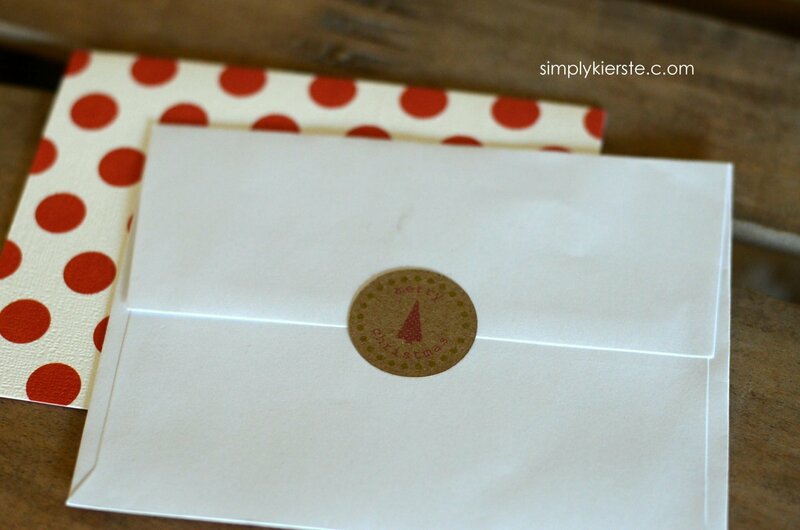 Think gift tags…address labels…envelope labels…and more! 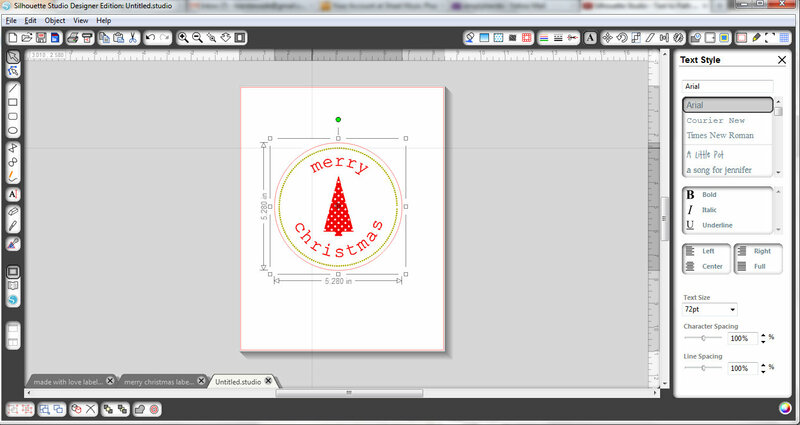 I’m going to share the tutorial for making circle labels, but you can do other shapes too! If you have any questions at the end of it, please ask me–I’m happy to help! 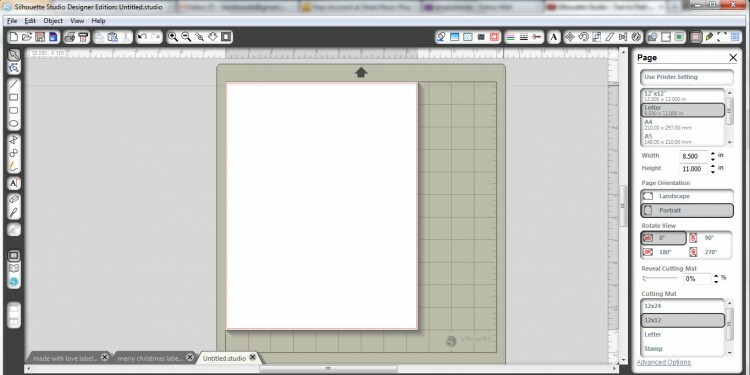 Okay…open up your Silhouette software, and set it to 8.5 x 11, and a cutting mat–whatever size you are using. I use a 12 x 12 mat, as you can see on the screen. Use the circle shape tool (on the left sidebar) to make a circle–the size doesn’t really matter, but you want it large enough to see what you’re creating. Click on Object > Make Compound Path. This will help me make my text rounded, and curve around the circle. If you don’t want rounded text, you can skip the next couple of steps–just use the text tool to type the text you like, and place it wherever you want inside the circle. 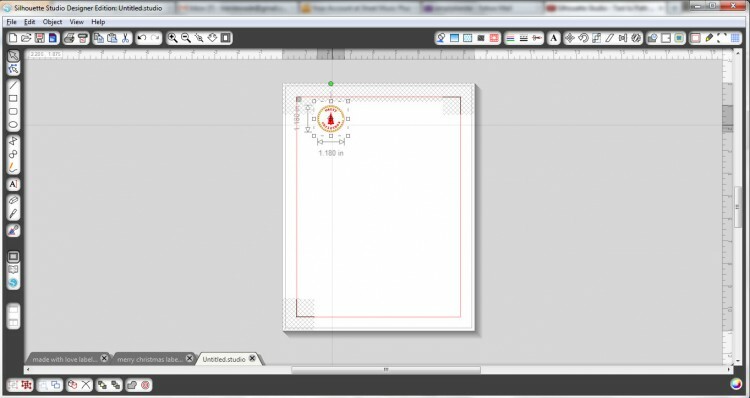 If you would like a different shape–square, rectangle, or other shape, you can use the shape tool or insert something from your library instead. Click on the text icon, and type out your text in desired font. DOUBLE click on the word, and it will have a green box around it, with a little round target looking icon (you can see it right on the “m”). You can maneuver your text if you click on that icon–move it down to the circle, and it will automatically go around the circle. If it moves, or you need to change it, just double click again on the word, and it will bring that little icon back up again. Repeat this process for any other rounded text you’d like. If the spacing looks to crunchy or funny when it goes around the circle, you can change the character spacing to spread the letters out a little bit until you get it the way you like it. Once your text is rounded, you can Click Object < Release Compound Path. Click on the circle and delete–you don’t need it anymore! Create another circle using the shape tool. Make it as big as you like in relation to the text–leaving as much or as little space as you want between them. 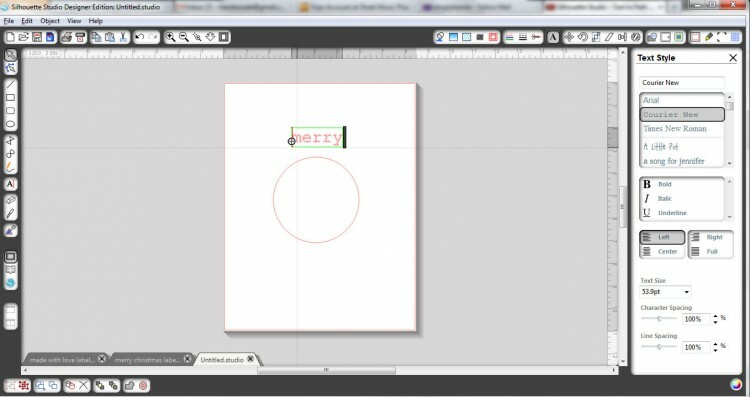 I wanted a dotted line, so I clicked on the line style icon at the top of the page, and chose the smallest dotted line. It will look really tiny on your circle at first, but we will eventually be making it a lot smaller, which will make the dots further apart and bigger. If you choose a larger dotted line now, it won’t look much like a dotted line later. You don’t have to dot your line–you can leave it solid if you like. Click on the Line Color icon, and select the color you’d like your dotted line to be. Do the same thing for your text, but use the Fill Color icon. I wanted to add a cute graphic to the middle of my label, so I opened my library, and chose the one I wanted. I didn’t want all three trees, so I ungrouped them: Object < Ungroup. Then I could delete the trees that I didn’t want. I grouped my last tree after I deleted them, since it was made up of more than one part. Just highlight what you want to be grouped, then go to Object < Group. I clicked on the Fill Color icon, and made my tree red! You need another circle! 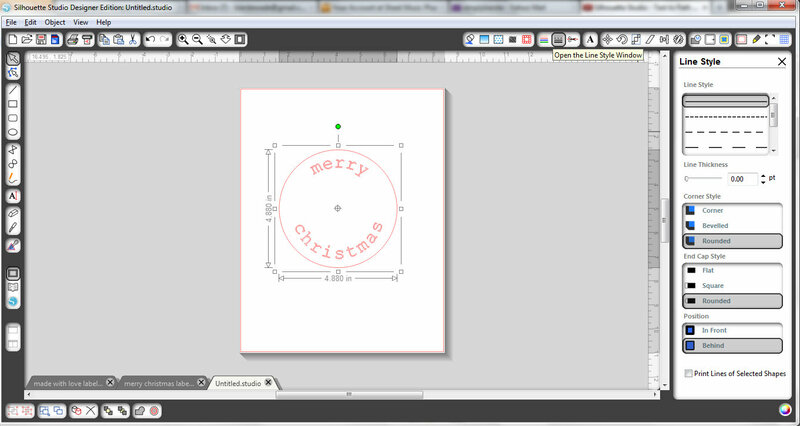 This circle will be what’s actually cut out by the Silhouette, and any blank space between your dotted line and the new circle will be how much cardstock is left when it’s cut out. I like having the kraft paper show on the edges, and give the dotted line a buffer, so I adjusted my newest circle accordingly. Once the circle is where you want it, you need to group the whole thing together. Highlight all the parts, then click on Object < Group. Now you can move it where you want it! This step is super important—click on the registration marks icon, and make sure that little box at the top that says “Show Reg Marks” is clicked. I took a screenshot too early of this step, so you don’t see mine checked, but it’s imperative for using print & cut that it is. Next really important step…you have to change the cut style to “CUT EDGE”. This means it will only cut that outside circle, and not all the other stuff inside–which it would otherwise. 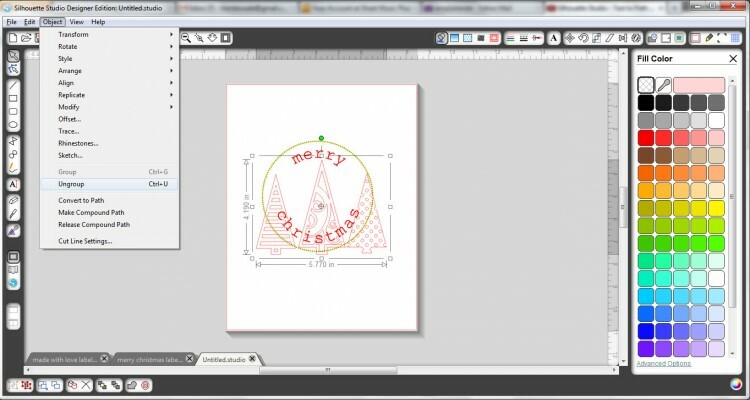 Now you can re-size your image to the size of label you want it to be. I sized mine to about 1.2 inches. See all those grid marks? Those are the registration marks, and you have to keep your image inside both those grid marks and the red border. It won’t print or cut correctly if not. If you want a whole page of these labels, then go to Object < Replicate < Full Page. It will automatically fill the page with that exact image, and will also stay within the necessary lines. Now it’s time to print!! Click on File > Print, and print to your printer. Make sure your adhesive printable paper is already loaded! Once it’s printed, you’re ready to cut. 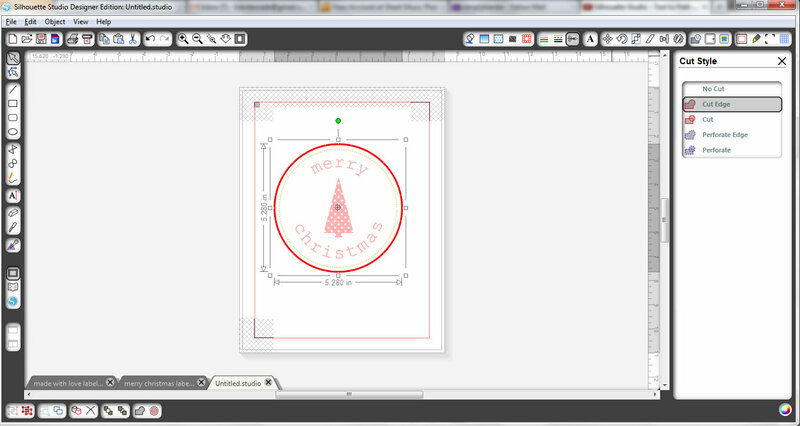 Place your printable paper on the cutting mat as shown on your screen, then load it into your Silhouette. 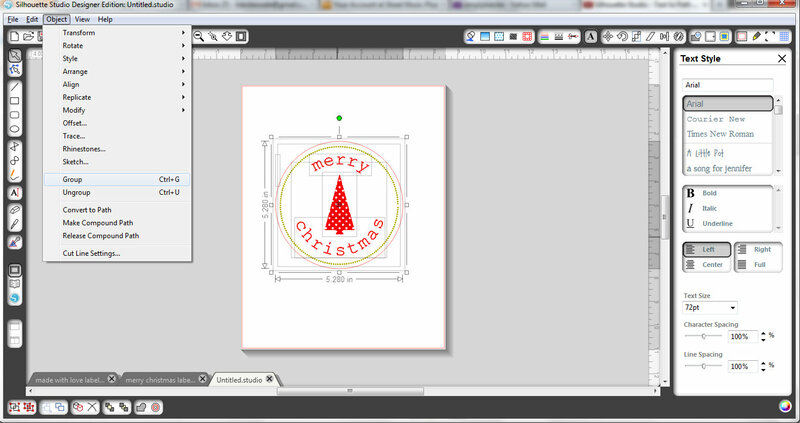 Select File < Send to Silhouette, and follow the prompts. Select the type of printable paper you’re using, and adjust your blade as necessary. Once you’ve walked through everything, then click cut. You’ll be amazed at how it knows just where to cut!!! 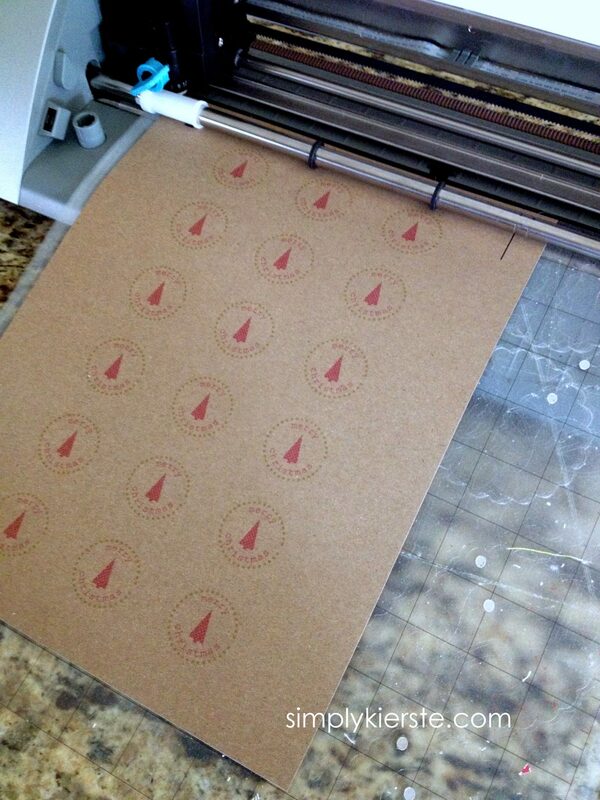 And you’ve got darling adhesive labels!!! Thanks for the awesome tutorial! I recently bought a cameo and am still in the “total newbie” phase. Can’t wait to try this out! 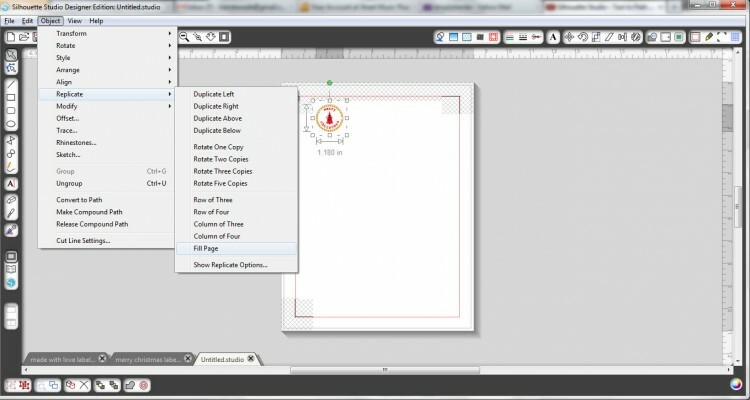 “Once your text is rounded, you can Click Object < Release Compound Path. Click on the circle and delete–you don't need it anymore! " When I do that either the top or bottom text goes straight again. Tried several different times but I always lose the rounded text when I release the compound path. Any ideas? I did get around it by just making the circle line "no color"
You know Sarah, this happened to me once or twice, and I just went ahead and deleted it without releasing the compound path, and it was totally fine. I don’t know why it does that, but you can work around it. what do you do with all the excess paper? There really isn’t much left–just small scraps, so I toss it! If there was more, I would save it to use again. 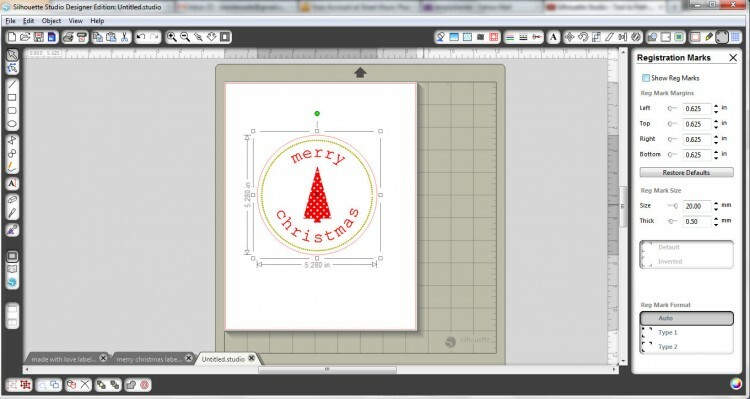 so I am brand new to this and trying this for my first silhouette project, but I can’t get it to cut my stickers correctly, it is cutting circles, but they aren’t in the right spot? I have read through it over and over and can’t figure out what I am doing wrong, any ideas?? The only thing that I can think of is that you should double check that the registration marks are on, and that whatever you’re cutting is within the red borders. Without those registration marks, it won’t cut correctly after it’s printed. If that’s right, then I would check to make sure that your paper is lined up correctly on the cutting mat–that will also make a huge difference in the end result. Hmmmm…I’ll keep thinking about it–let me know if none of those things work! Glori, Just thought I would add you absolutely have to add those registration marks. I attempted it thinking I knew what I was doing and thought I’d lined it up perfectly and I messed up two pages. After that I saw this post and attempted it again WITH registration marks. Everything came on right on the dot. Huge difference! Thanks for writing this post Kierste! Thank you for adding that, Amanda!! I’m glad it helped make everything work for you! Merry Christmas!!! When I try to replicate the page, it does it, but it makes the bottom circle text straight on the ones that it replicates. Only the original circle has circular shaped text in the replicated circles. Does that make sense? I can’t figure it out. Did you group it together before trying to replicate it? Can you send me a screenshot? most helpful tutorial ever! thank you very much!!! I’m so sorry! I wish I was there to look at your computer and help you figure it out! HI again Kierste, What I did to make it cut ONLY the outside edge was I highlighted everything EXCEPT the outside edge in “cut style” and clicked “No Cut” -problem solved! :) Yay!! Hi Wanda–I just wanted to make sure you saw the last comment to this post! She had the same problem (or similar ) to you, and posted how she fixed it!!! Thank you for this great tutorial! Everything is working except that the dotted line will not print. Do you have any ideas? Hmmmmm, I’m not sure. Let me look at it again and see what I can figure out. Thanks for taking a look and replying! I think I found out what was wrong. The line thickness for the dotted line was set at 0 so I increased that a little and it printed! Thank you for a great tutorial! I was having the same problem, thanks for posting the answer! Wonderful! I just got a Silhouette today and was wondering if I could print and cut designs. Your tutorial showed me exactly what I wanted to know. Thank you! Thanks for the great tutorial. It was very easy to understand and follow. Had one quick question. When I make the cuts, the first half of the page the cuts line up just fine with the printed images but on the bottom half of the page the cuts don’t line up. It seems like the paper is sticking to the mat just fine so I don’t think the page is shifting so why would the accuracy of the cuts decline as it goes down the page? Is there some step I am forgetting ? oh, and I should mention I am using the usual registration marks and the silhouette mat that came with my new cameo. Printing on sticker paper purchased at staples. Planning on printing on higher quality paper but didn’t want to waste the expensive sticker paper on some test runs (still trying out different sizes and designs). I would double check to see if your paper is shifting at all–I can’t think of any other reason that it wouldn’t be cutting the same on the whole entire paper if the registration marks were set. Hmmmm…let me think on it. I’m so sorry–I know it’s frustrating!! Thanks for your reply. I tried printing it again and made sure that the paper was secure and it happened again. Then I made another sheet of stickers where the stickers were larger and that came out perfectly. I think what was happening was that the shape of my stickers was pretty intricate (outline of state of Texas) and because of that and because there were so many stickers on the sheet, it must have moved the sheet somehow. I like the stickers a little bit bigger anyway so problem solved. Yay! I’m so glad it worked. If you were willing to sacrifice one of you higher quality sheets, it would be interesting to see if it would. This tutorial is great but I can’t figure out what I am doing wrong. 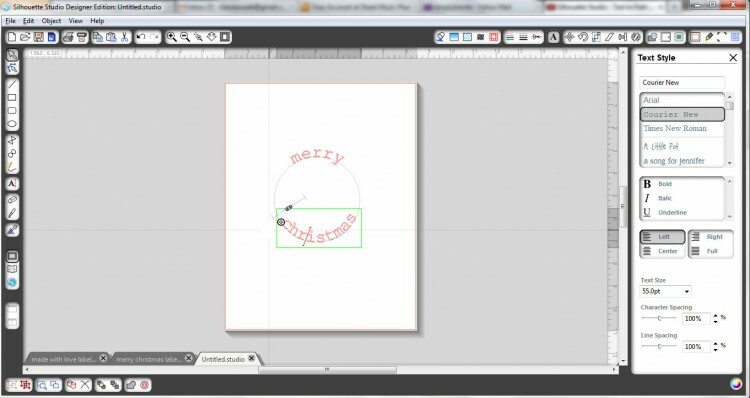 When I send the finished file to print, it only prints the image from the Silhouette store. It doesn’t print the circle or the text inside of it. What could I be doing wrong? You know, I’m not sure! Did you group it together to make one object? I’m going to be doing a print and cut project tonight, and I’ll see if I notice what could be happening. Im having the same problem. I just got my silhouette and having fun with it so far, but now im to print and cut and it’s not printing the words on my design. What am I doing wrong? Did you click the registration marks box? That is key. Great tutorial, but my problem is that the wording that is going around the circle (outer edge) is not printing. I have grouped them all together. I had the same problem with the dotted line but the comments above helped me solve that! Any suggestions would be great. So you don’t have dots or a line around the edge, but text instead? I made the first circle, then put text around it and around the bottom. Then put a picture and took the circle away then put another circle (dotted) about the picture but not the rounded text (wording). Then I put the larger cut circle around it all. I can send you a picture if it would be easier for you to understand. Actually, send me the silhouette file too!!! I am loving this tutorial and have wanted to figure this out for so long! I am just trying to highlight all the parts before I group them so I can move them and can’t figure out how to do that. Thanks for the help! Hi, I just got a silhouette for Christmas. Right now I am messing around trying to learn to work studio. I was trying to put together a sticker as you have here but my bottom word “Christmas” is coming out upside down and I can’t get it right side up around the circle. Any suggestions? I figured it out! Very simple fix. Just had to move the word into the circle not on the outside! I never saw in the tutorial on which paper you are using and how it is printing color! Or did I somehow miss it? I am new with the machine and trying to figure out how you did this! Thanks! Thank you for the wonderful tutorial. I love the print and cut feature! The problem I have is after everything is cut and I go to remove the paper for the mat, it curls up, leaving my stickers curled up. I’m using Avery full sticker paper. Any suggestions? Can I cut it without the mat since it has its own backing? Thanks for any help in advance. Hello, this is a great tutorial. I see much more clearer except that I am trying to print out small stickers first.. like simple images like a cup. 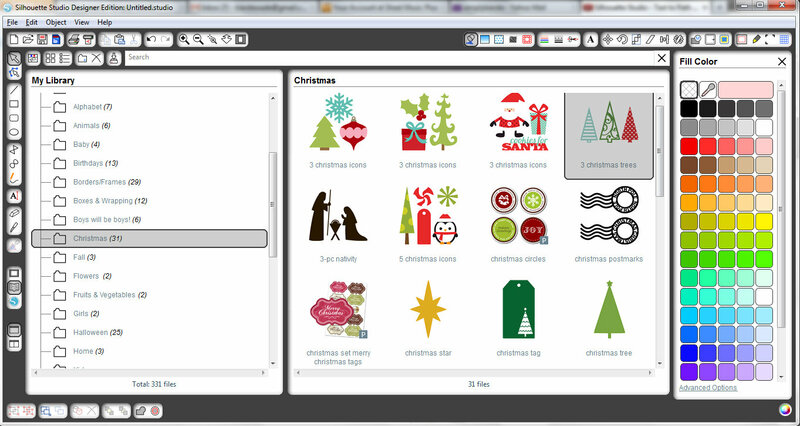 I have been playing with the software (the basic download) before buying a silhouette portrait. I also wanted to see how well my printer prints in color, not too chevy! Um.. i am having real problems with getting the sizing down. I am using the basic download and scale option. That is not the best because if i tweak one W to say .500 the H goes to a different number and I cant one or the other size at that size to play with the size. Its frustrating. This is why i wanted to play with the software before getting a printer like this. Now i dont have the ruler on the side, it doesnt come with basic i believe … i can upgrade later to the other ones thats 50.00 or wait to get the one from the printer itself. Please tell me this all make sense? No one wants to go looooowww to explain this to me. I am not interested in making a business out of this, i just want to make things with family and for my small planner pages. Please email me at djhavoklover04@yahoo.com so we can better understand this. These things are hard! Thank you so much. I would really appreciate the help. (I plan to show this to my nieces who are 11 yrs old. and hope to get them engaged in something healthy). Hi, Bekka! Have you already figured this out? Let me know! Imagine my relief when I had to google “How to print and cut on my silhouette” and up popped a link to your tutorial. You saved the day for me….again! Lol! You explain it better than the other tutorials I had pinned on pinterest. I just made my first sale in my Etsy shop, and needed to make a label for instructions, so thank you, thank you, thank you for your awesome interpretation and instructions. Hi, i am wondering, did you use sketch pens or any other diy pens for this? I can’t find many links on how to do return labels, which I want to do or possibly labels for wedding invites! 9yikes the pressure, it’s for a friend too!) So I would like mine as a rectangle for the return and the invite labels not sure yet, any help with this? Also does the registration mark have to be on? i am doing the clear adhesive paper for all the labels. I didn’t use sketch pens, I used the print & cut feature. I created the text and label in the Silhouette software, printed it on my printer (yes, you need registration marks), then put it through my Silhouette and it cut out the labels. You could definitely do return address labels and address labels. Everything is there in the tutorial–you would just create your own text and printable and then follow the directions to print & cut! 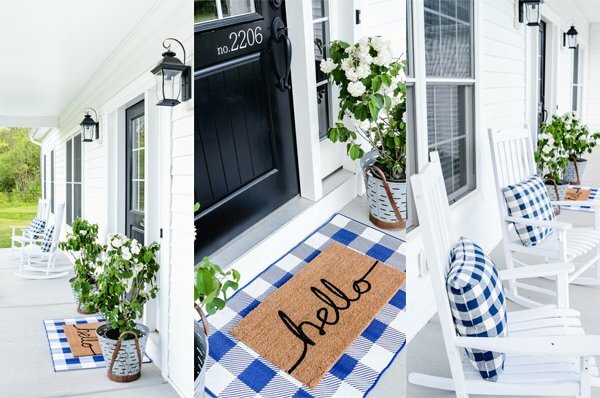 Hi there, LOVE this tutorial and sooo glad I found this! How do you KNOW you are getting a 2.5” circle? Is there a way to size your circles to inches ie: 2.5″? Hi there! Which printer and paper do you recommend for doing this ? I’ve used several different printers, but HP Envy is my favorite! I also use a variety of papers, depending on the project, and what I’m using it for. White card stock, colored cardstock, adhesive cardstock, full sheet white labels…all of them have worked well! Adorable! I recently got a cameo 3 and am slowly learning to use it, while plannig 800 different ideas of everything I want to do for my sister’s bridal shower! Thanks for this tutorial, it’ll definitely help me with the labels for her candle-favors I’m making. 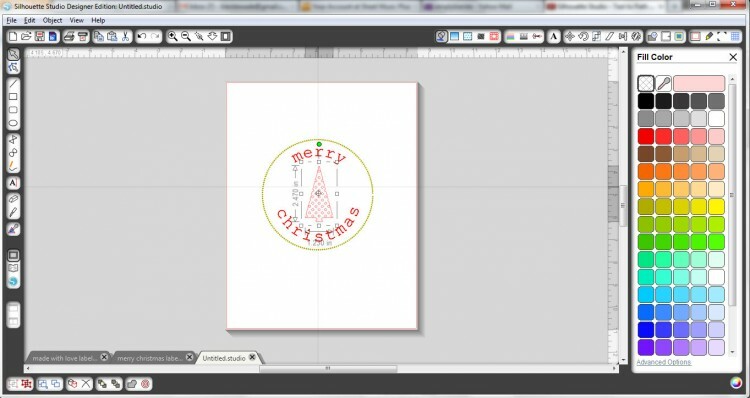 Where did you get the paper you made these Christmas labels? The’d work perfect, since she’s doing a rustic themed wedding. Thanks! They cut do many things, from paper to vinyl to heat transfer material to so much more! I want to make labels for lip balm tubes. From what I’ve read in your tutorial and the comments, I need to print the labels on my printer (since I intend to make them colored) and them I feed the printed labels into the Cameo and size them as needed to fit the tubes. I’m confused about printing the colored/image on my regular printer?? 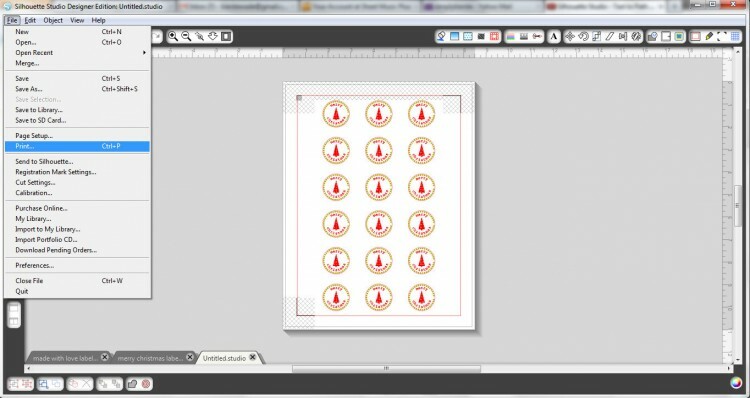 What program or software do I use to design and print the images in preparation for then feeding them thru the Cameo to be cut to the dimensions of the tubes? 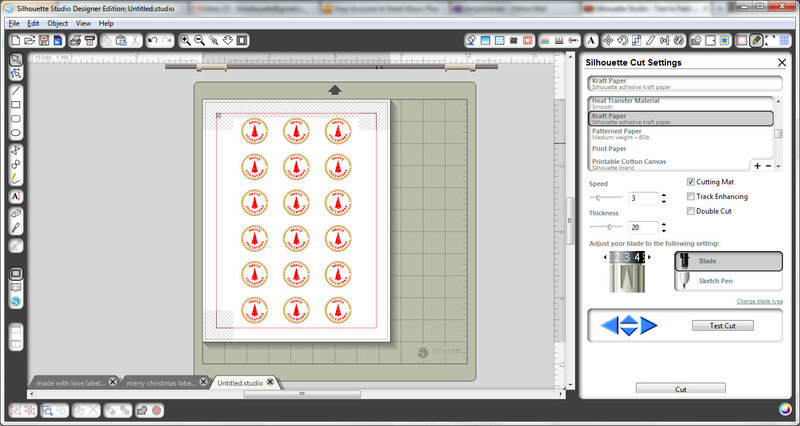 Do I need to do it in another prorgan OR do I do it in the Silhouette Studio software and then send it to my printer? Hi, Andi! Yes, you’ll need to print the image first, then cut it out on your Silhouette. You actually use the Silhouette software to create the printable image (whether you create your own, use one from the Silhouette store, or a combination of both), and when you follow the tutorial, make sure you add registration marks as part of that process. The printer then prints not only your image, but the registration marks too, so when you put it in your Silhouette machine, it reads those marks and knows where to cut.